Our training staff is among the most diversely educated and professionally experienced in the region. Our trainers are also qualified by certifications to work with special populations including prenatal, cardiac, diabetic, postoperative, and many more. Whether you need motivation, instruction or guidance, help working through a plateau, accountability, or variety in your training, a trainer will be the person who can see you through to your goal. Meet our training team below, or if you would like to meet with someone to help you find the right fit, ask us to schedule a Road2Success fitness planning appointment! 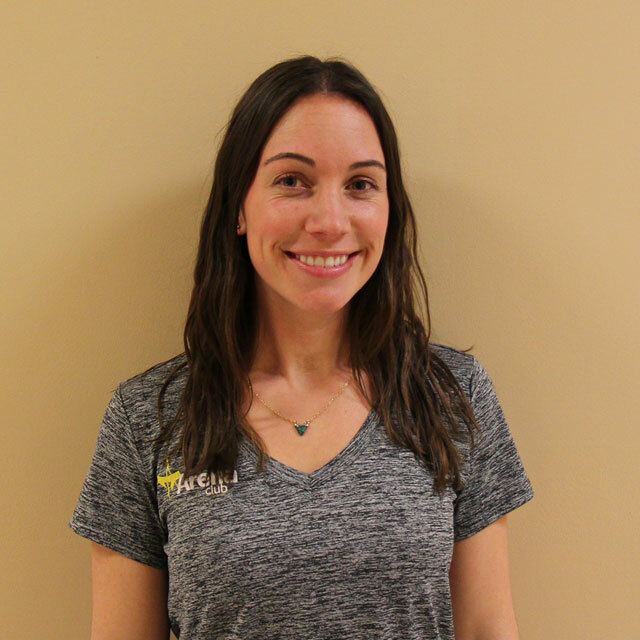 Alicia is the club's Group Fitness Manager and has a degree in Business Management and Holistic Nutrition. Andrew played football, basketball, and baseball throughout high school in Cecil County where he grew up. He then went on to play football at Widener University. Betsy is a certified ASCA Level 5 coach both in education and achievement. Chavez grew up in Harford County and attended Aberdeen High School where he played football and ran track and field. He attended Shippensburg University as a football athlete and earned PSAC Eastern Freshman of the Year. 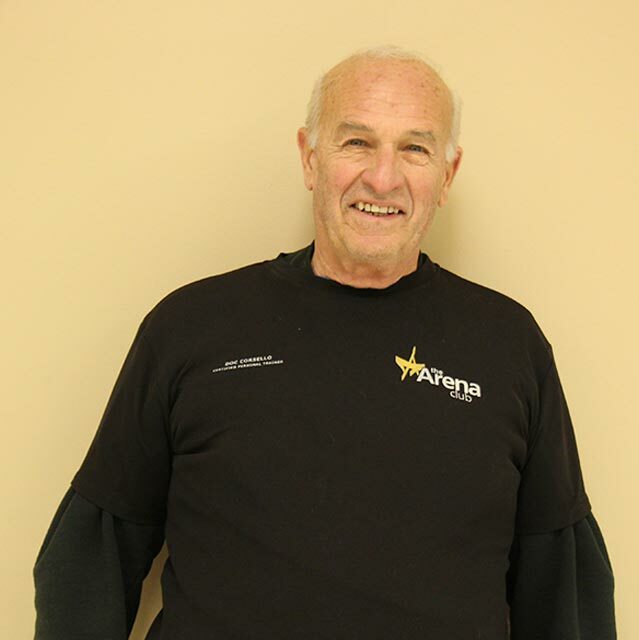 Richard "Doc" Corsello has been with The Arena Club since it opened. His favorite way to stay active is swimming. Erin grew up right here in Harford County. She graduated North Harford High school playing soccer, and softball throughout. Gwen specializes in yin yoga, restorative yoga, yoga for athletes, kid’s yoga, breath work and meditation as well as aromatherapy. Hilary found her passion for fitness by changing her own life, and then her goal became to help others change their lives for the better. Isaiah is a Harford County native and a Harford Tech alumnus, where he was a football, basketball, and track athlete. He received a full scholarship to Wagner College to play Division 1 football, and was also a track and field athlete. Joe grew up locally in Harford County, playing soccer through high school. Prior to coming to The Arena Club, he studied Sports and Society at University of Arizona. John played lacrosse at St. John’s University and York college of Pennsylvania where he was selected 1st team All Conference (CAC) and honorable mention All American. He grew up playing lacrosse and soccer, where he was a member of the ODP state and regional U12-U16 teams. 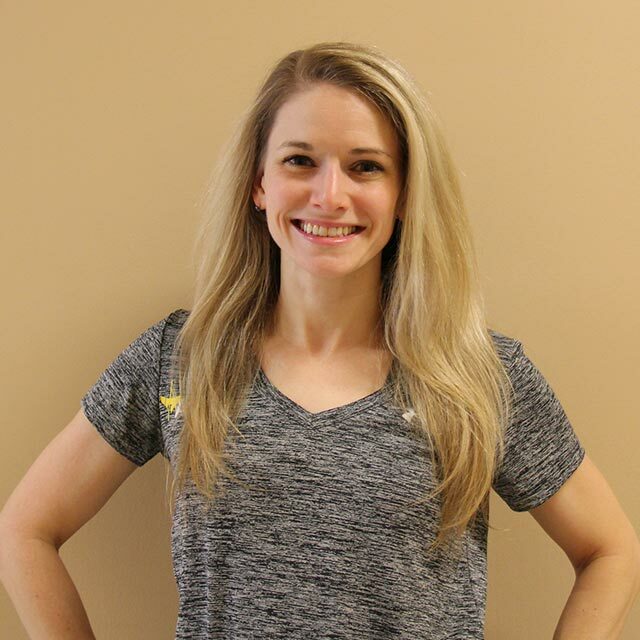 Justine is a Certified Personal Trainer, Group Fitness Instructor, and Fitness Nutrition Specialist. She is also an Assessor with the Les Mills US Team. 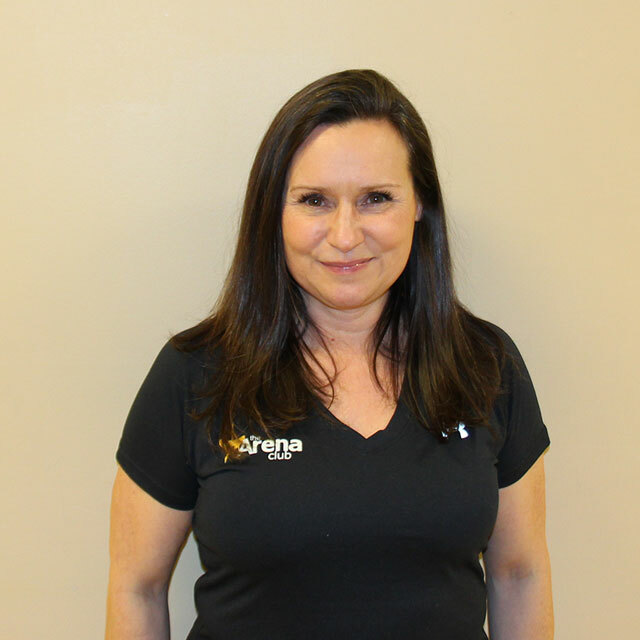 Kathy has been with The Arena Club's fitness team since 2006. She also has been working in the community as a Workplace Wellness Coordinator for the past six years. 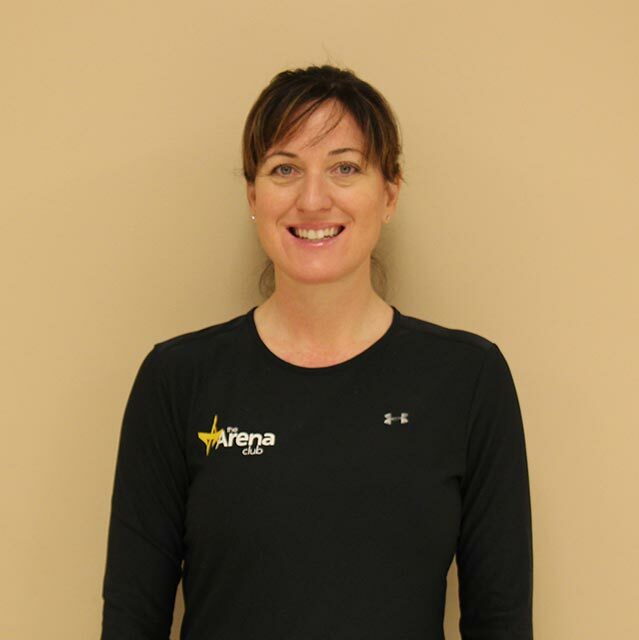 Kim started as a group fitness instructor with the Rawlings at Harford Health & Fitness in Aberdeen in 1991 and has been with The Arena Club since we opened in 2003. Mark has lived in Bel Air, Maryland his entire life and has played baseball and hockey competitively. Megan grew up on a cattle and horse ranch outside of Cheyenne, Wyoming. She joined the Navy in 2002 and served honorably for 7 years and now lives in Bel Air. Nicole graduated from Salisbury University with a degree in Exercise Science and was the president and captain of the women’s rugby team. 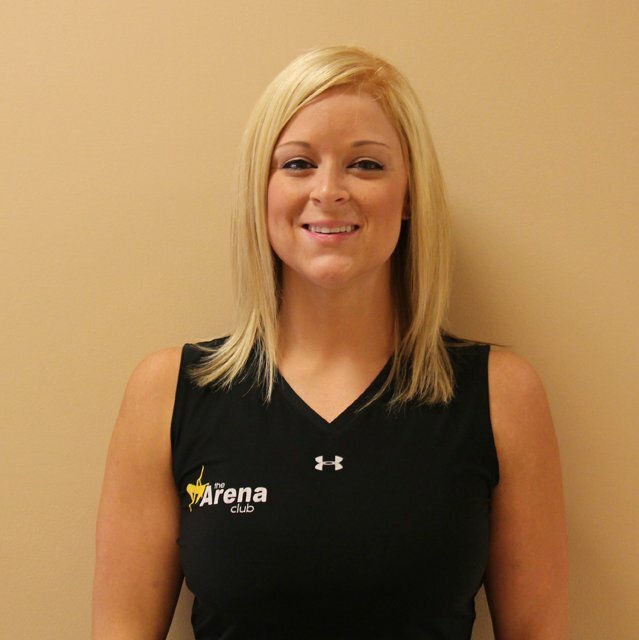 Nicole has been with the Arena Club since 2007 and is our Wellness and Athletics Director. Qadry Ismail grew up in Wilkes-Barre, PA and is a member of our Sports Performance Training Team. If you are from Baltimore, you will know Qadry as a Super Bowl champion and Baltimore Ravens "Go-To" receiver on the 2000 team. Qadry played professional football for 10 seasons. 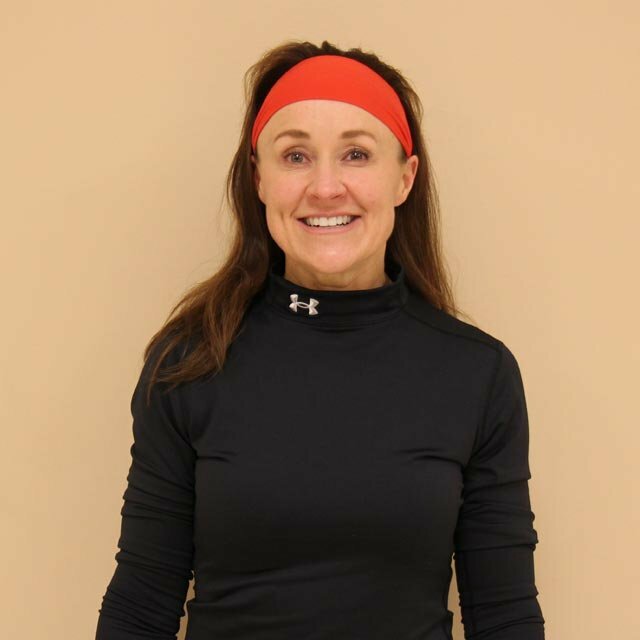 Rose spent many years in the medical field then moved on to being a wellness coach and personal trainer to continue her passion for helping people. Sandy holds a Master’s degree in Exercise Science and Health Promotion from Florida Atlantic University. 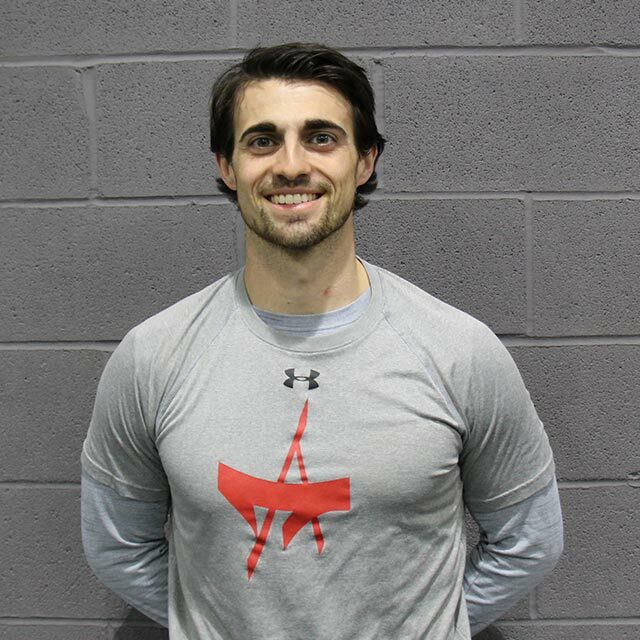 Sean has been a strength coach for almost a decade working with general population, elite athletes and US Air Force Special Forces. Shaunna was a gymnast from a young age, participated in many different sports throughout high school, and was a collegiate cheerleader for the University of Texas - El Paso. 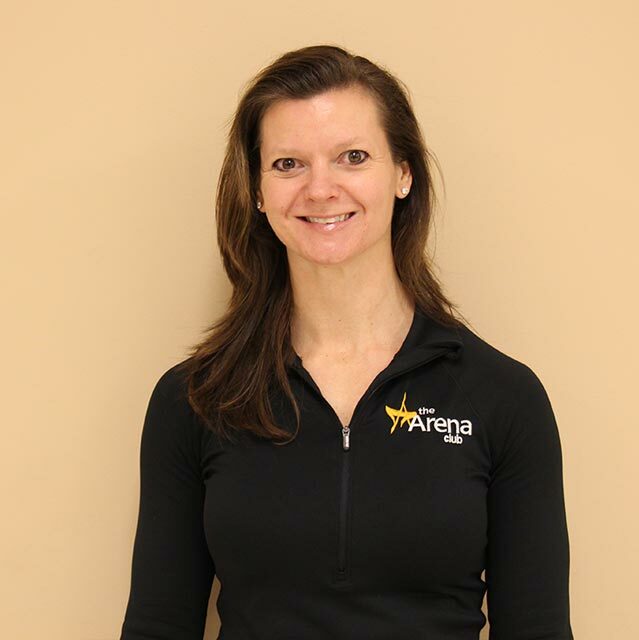 Susan has worked with athletes for many years, introducing Pilates Reformer into their training routine and working closely with their trainers to build specific programs for their specific sport. Susan has worked in the fitness industry for over 30 years including group exercise classes, cycling, yoga, Pilates and personal training. 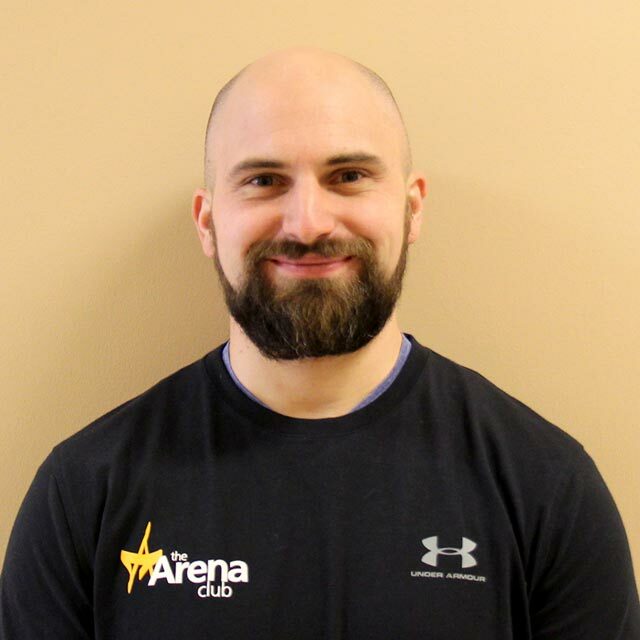 Tim is an NSPA certified personal trainer, a BOLC certified lifting coach as well as a MORR sports performance coach. Trish grew up in Baltimore, Maryland. She played Division 1 basketball at Fairfield University where she received her BS in Sociology. 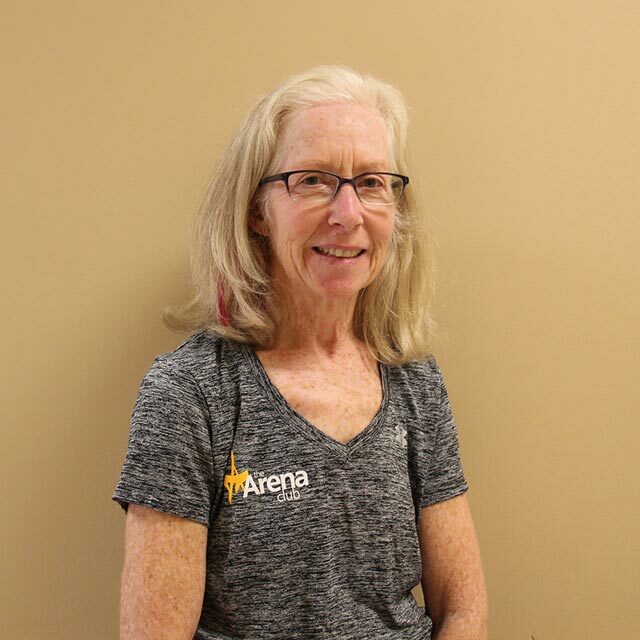 She has been with The Arena Club since 2006! 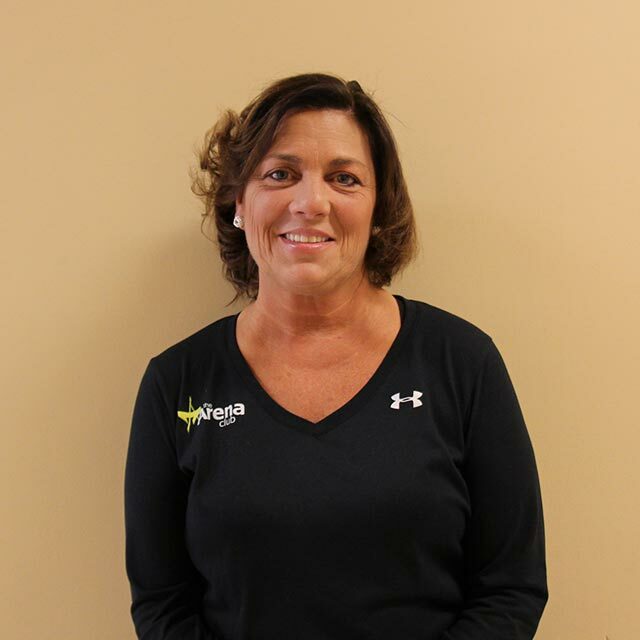 Wendy has lived in Harford County for the past 15 years and has been in the fitness industry since 1995. 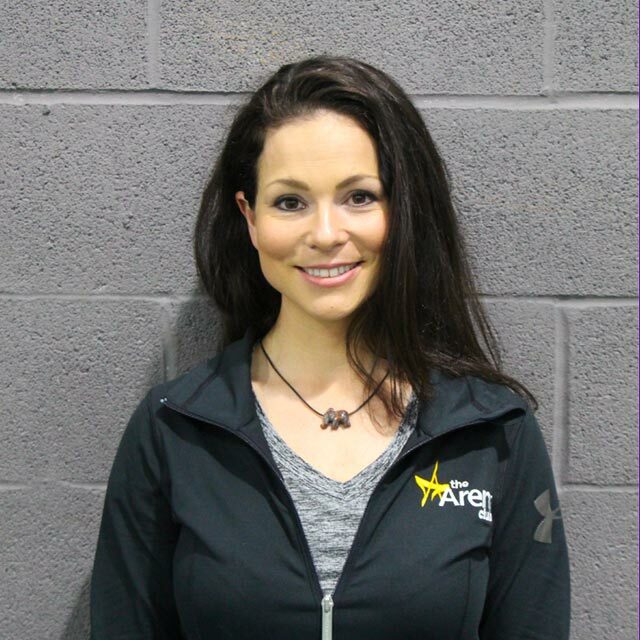 Alicia has a degree in Business Management and Holistic Nutrition along with a variety of fitness certifications. When she’s not at the club, she likes to watch her kids’ games and really enjoys seeing a variety of live performances and events. Family, friends and faith are her heart! What led you to The Arena Club? I was working at a local health club that was bought out by a corporate franchise. Working in the corporate world and going through several company buy-outs, I wasn’t feeling that my values aligned with the change of leadership. During this time, I would drive by and watch the construction of AC and often thought how much closer to home this health club would be. Two instructor colleagues told me about auditions for group fitness instructors at AC. I’ve been here since the doors opened in January of 2003 and have never looked back! What would you say to someone who is considering personal training? Exercise and good nutrition is the strongest prescription medicine! The gift of good health is the best gift you can give to yourself. Personal Training is a great way to set yourself up for long-term success by having a personalized program that fits your schedule, needs and goals. Plus your training sessions will never get boring! I’ve lived on the west-coast, south and east coast which has broadened my perspective on how demographics plays a role in peoples health and fitness habits. Shortly after college, I spent 10 years in a successful and demanding corporate account executive position while teaching group fitness classes in various health clubs. After my son was born, I realigned my priorities and left my full-time job to pursue a career in fitness and nutrition. It toke a few years along with many 4am morning wake-up calls to finish an online holistic nutrition degree along with many other health and fitness certifications. I wouldn’t change this path...LOVE my job….LOVE our members! What do you enjoy about being a Personal Trainer? My favorite part about being a personal trainer is helping clients realize that they can do much more than they thought they could. It is so rewarding to be part of their journey. As the physical strength increases, so does the mental strength. Willpower is a muscle in training! Andrew grew up in Cecil County, Maryland and played football, basketball and baseball throughout high school. He then played football at the collegiate level at Widener University where he graduated with a BS degree in accounting. Andrew has trained athletes at all levels from youth to professional. What led you to The Arena Club? I was once an owner of a sports performance facility that wasn't able to continue due to unfortnate events. When I heard about The Arena Club and The Arena Sports Factory, I knew I wanted to be a part of this group and compliment its growth any way that I could. What is your approach to training? I am big on providing complimentary assessments. This gives me an opportunity to meet the athlete and their family, discover goals, and learn about the client on a more personal level. Then we can discuss any weaknesses of the athlete and how we can build upon that so the athlete will have the best chance possible to succeed. What do you enjoy about being a personal trainer? I love the opportunity to be a coach in someone's life. It's great to see the spark in an athlete's face when they talk about the future and their goals. There is no better feeling than to see an athlete begin to see results and confide in you to make a difference in their lives. What would you say to someone who is considering personal training?Personal traines are not only trainers, but COACHES. We are here to converse with, grow with, and crush your goals with! You will achieve more out of training by having soeone push you and hold you accountable. Share something interesting about you: Outside of training athletes, I love the opportunity to get outside to be in a tree stand hunting or on a boat fishing! Betsy’s swimming career started in South Texas in high school and carried over to college swimming where she was an NCAA Division I qualifier. Her love for swimming continued on into the coaching realm where she has been coaching for 32 years. Betsy is a certified ASCA Level 5 coach both in education and achievement. What led you to The Arena Club? I came to The Arena Club four years ago because of family. The Arena club was built around a strong foundation for families. I felt like family when I walked into the door. I was able to come in and start coaching and work with some great families and help a lot of swimmers achieve fast times across the board. I have been able to create an all-around program from dryland to the pool training. What is your approach to training? I am all about individual training. I get to know my swimmers and we develop stroke, fitness and mental training to succeed. What would you say to someone who is considering personal training? When looking for team or a coach to train you it is important to look at how well rounded the coach is. Betsy has worked with athletes from a young age to college-aged swimmers. She has experience in stroke technique, dryland training and weight training. What are some of your specialties? In my years of coaching, I have found that the one thing that I excel in is teaching the swimmer through their hard work how to believe in themselves and help them achieve even more than they ever thought they could do. Share something interesting about you: When I am not on the pool deck I love to cook. I experiment with everything but baking. Besides cooking, I love being outside camping and Kayaking. I have a degree in Outdoor Recreation. Chavez grew up in Harford County and attended Aberdeen High School where he played football and ran track and field. He attended Shippensburg University as a football athlete and earned PSAC Eastern Freshman of the Year. Chavez graduated with a Bachelor’s degree in BusinesAdministration/Entrepreneurship. He enjoys coaching, learning and helping others achieve their goals. What would you say to someone who is considering personal training?Having a personal trainer can be a tool to enhance your fitness lifestyle. A personal trainer brings forth a different mindset, new exercises that can better help the body perform. Personal trainers look to correct the wrong and allow you to move better with little to no pain. A personal trainer looks out for the interest of the client. What led you to The Arena Club? Once I graduated from college I came to the Arena Club to train to have a chance to be on an NFL Team. Once I got to the Arena Club I meet Keith who was training me and another young man. While training began to actually build a love of helping other young athletes achieve higher goals as I have. From that point my goal has been to help them make their dreams of playing Division 1 athletics and even a chance onto a professional team. What is your approach to training? My approach to training is to first learn what their workout history is. From there I look at their range of motion, and what areas they are weak in and what areas are they strong in. Next, I like to find out what their favorite exercises are and what it is about those exercises that they like. From this, I build a regimen that will be best for them to achieve what they are looking for. What do you enjoy about being a personal trainer? What I enjoy about being a personal trainer is interacting with new clients and showing them new things that can help them. I enjoy the journey of helping them achieve their goals. I enjoy seeing clients work hard and smiling when they finish. If Doc is not training, you can find him swimming! He won first place in the 50-meter breast stroke in the 2017 Maryland Senior Olympics - proving fitness can be fun at any age! What do you love about your job and why? I love helping seniors with everyday tasks of living and people with problem areas - walking, balance, and strength. What made you decide to get into the fitness industry? I am a gym swimming rat. All seniors who are trying to improve their life. Share something interesting about you: I won first place in the Maryland Senior Olympics in 2017 in the 50-meter breast stroke in Mens age 75-79 category. Erin grew up right here in Harford County. She graduated North Harford High school playing soccer, and softball throughout. She received her B.A. degree in Psychology from Towson University. She has been in the fitness industry since 2010. When not training or teaching in the gym she enjoys running in distance races, playing co-ed football and softball. What led you to The Arena Club? I came to the Arena Club after working at a few other local gyms in the area. The first thing I noticed, other than how amazing and nice the facility was, is how welcoming the staff and members are. The facility and programs offered are top-notch!! You will not find any other facility in Harford County that could even come close. What is your approach to training? First, I meet with my client to talk about goals, limitations, and expectations. Before we even pick up any equipment, I give them a starting assessment so we have a baseline to look back on when they see how much progress they are making. Also, I will check their form to make sure we can progress safely. I am a free weight fan. I love it because it forces you to create your own stability through your core. So you are getting a great ab workout without even realizing it! What would you say to someone who is considering personal training? Having a personal trainer can really jump-start your fitness journey. They will design a plan that is best for you while making sure you have safe and effective form. They will also help with accountability, motivation, and getting you out of your normal routine which may have been less successful due to plateauing. Share something interesting about you: I am a thyroid cancer survivor! Having the word “cancer” attached to my name is never something I could have imagined happening to me. I have always been extremely healthy, have had no family history, and had no symptoms leading up to my diagnosis. The thyroid controls virtually every cell in your body and it will always be a struggle for me to find that balance in my body. But you know what? I am worth the fight and this is only making me stronger. We are always going to experience a set-back or a struggle...it’s how we come out of it that counts. You are stronger than you think you are and sometimes struggles are there to show us that!! Gwen was a typical “Type A" - hardworking and driven, but not taking care of herself. Yoga allowed her to find balance in all areas of her life. She is a home grown yogi thanks to the encouragement of other teachers and trainers at The Arena Club who encouraged her to take yoga teacher training. What led you to The Arena Club? I first came to The Arena Club as a member in 2001. I was a full time working mom then transitioned to a work from home mom. I missed that people connection and found it here. What is your approach to training? As approaches to health continue to evolve, yoga will be a primary vehicle for the wellness programs of the future because of its ability to promote health and healing at physical, emotional, and spiritual levels simultaneously. Yoga is already being accepted into mainstream wellness approaches at hospitals, businesses, schools and universities, and a variety of other settings. Offering one-on-one Yoga Coaching sessions bring these concepts to The Arena Club. What would you say to someone who is considering personal training? Yoga coaching focuses on a client’s needs using yogic tools and techniques, rather than focusing on yoga methods as in a group class. These needs can run from injury recovery to sport specific training to pre/post-natal support. Yoga Coaching can bring relief from many health problems as well by reducing stress. What are some of your specialties? I love utilizing my specialty trainings one-on-one with my clients. My 200-hour and 500-hour training include focused modules in yin yoga, restorative yoga, yoga for athletes, kid’s yoga, breath work and meditation as well as training in assisting and aroma therapy. Share something interesting about you: I am a Leo. I lived in New Hampshire before moving to Maryland but I was brought up in New Jersey, exit 7. My husband doesn’t think I am funny. I am not a vegetarian. I like piña coladas and taking walks in the rain. Hilary grew up in Baltimore County and played volleyball and lacrosse through high school. Prior to coming to The Arena Club, she went to college to study Nursing, but decided to take a break from college to start her family. 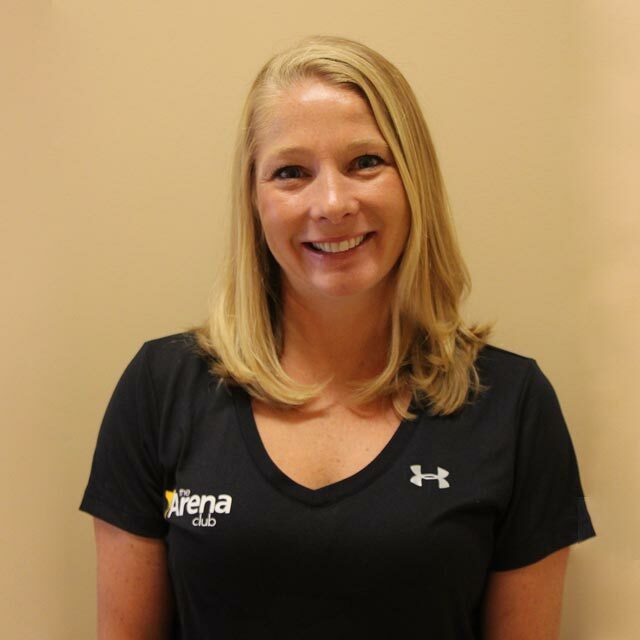 When not at The Arena Club Hilary enjoys running races, watching her sons Lacrosse games, long hikes with her husband and their dog, and just spending time with her family. What led you to The Arena Club? I had a friend bring me to try out the classes and became a member. After changing myself I was offered a job here and kept growing and changing over my years here at The Arena Club. What is your approach to training? I like to meet new clients to let them get to know me and at the same time learn about them. I get to know what their goals are and if they have any health issues or limitations that we need to be aware of that may affect the way we plan out their program. I like to know what motivates them, but also what doesn’t motivate them. Everything plays a role in a good workout plan. What would you say to someone who is considering personal training? It is an investment in your future that everyone should make. It is about improving yourself in some way shape or form that makes you a better version of you! What do you enjoy about being a personal trainer? I enjoy meeting new people, hearing about their lives, and what they want to achieve both mentally and physically in life. I feel you can’t have one without the other. Share something interesting about you: I had to change myself before I could help anyone else. I was obese in 1999. In changing my life, I found a way that I could help people change theirs for the better. It became a passion for me... I enjoy learning new things and applying them to change the lives of those around me. Isaiah is a Harford County native and a Harford Tech alumnus, where he was a football, basketball, and track athlete. He received a full scholarship to Wagner College to play Division 1 football, and was also a track and field athlete. He graduated with a Bachelor’s degree in Physics and Computer Science. He is currently a high school math teacher and sports coach in the county. What led you to The Arena Club? I came to the Arena Club as an intern. With my previous experience as a coach and a former college athlete, I still had that passion for the grind. Being able to change athletes’ lives through their own passions is the reason why I love this job. What is your approach to training? When it comes to sports performance, I want to know what you want to improve on. I want to get the athlete comfortable and confident in making sport specific movements. Giving the athlete game like drills for their sport, helps them visualize themselves playing. What would you say to someone who is considering personal training? There is no better feeling than making someone finally believe that they can do it. Changing lives, one second at a time. One rep at a time. One breath at a time. One set at a time. Getting someone to finally believe in their self is what makes this job so special. What do you enjoy about being a personal trainer? My goal as a trainer is to help you realize that you can have fun while working out. Expect to do a little a dance, have some fun, and get fit. No matter who you are or what you do, I want to help you improve your fitness as well as your mood. Share something interesting about you: I love to dance! So if you see me dancing, it’s ok to join in! Joe grew up locally in Harford County, playing soccer through high school. Prior to coming to The Arena Club, he studied Sports and Society at University of Arizona. 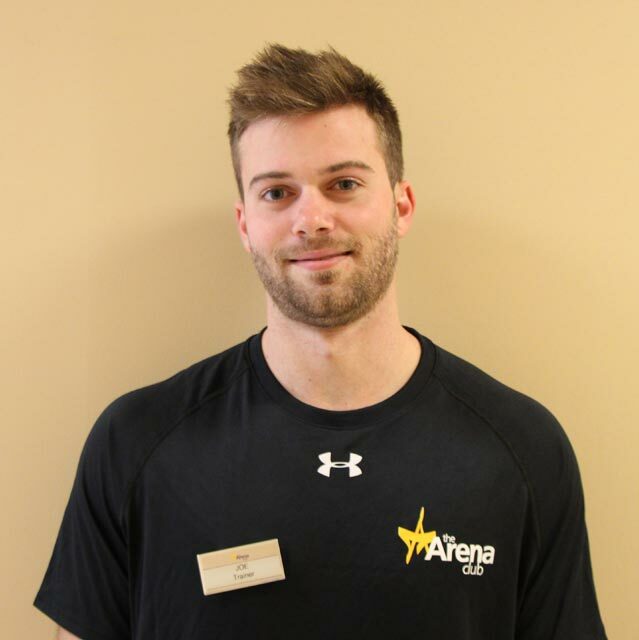 When not at The Arena Club, Joe enjoys playing soccer, guitar, and outdoor activities such as hiking and camping. What led you to The Arena Club? I have had a long history with the Club, starting about 10 years ago when I was simply a member attending the pool in the summers. Fast-forward a few years and I had become a lifeguard working at the very same pool I used to attend. Throughout college I often spent time during my summers shadowing trainers in both the club and the Sports Factory. After college, I knew where my passion was, leading me back to the Arena Club as an opportunity to explore these passions. What is your approach to training? Before training a new client, I like to have a constructive conversation in order to get to know them. This allows me to obtain a better understanding of their lives, medical history, and fitness goals. This is also a perfect opportunity for me to learn about any injuries or limitations that I will apply to their customized fitness program. Through this holistic approach I am able to create a personalized regimen to help clients succeed in their fitness goals. What would you say to someone who is considering personal training? While having a personal trainer may be daunting to some, it is a decision that can change your lifestyle for the better. A trainer can be the source of motivation and level of accountability necessary to achieve your goals, and the educated mind that provides you a personalized and efficient exercise routine to help you make lifestyle changes. What do you enjoy about being a personal trainer? One of the most enjoyable aspects of being a personal trainer is seeing the satisfaction a client gets after observing progress and achieving their fitness goals. Their new found confidence that a person gets after the realization of achieving progress is a great feeling. John played lacrosse at St. John’s University and York college of Pennsylvania where he was selected 1st team All Conference (CAC) and honorable mention All American. He grew up playing lacrosse and soccer, where he was a member of the ODP state and regional U12-U16 teams. John's training philosphy is to make people stronger. He enjoys spending time with friends, family, and his dog. What led you to The Arena Club? I moved to the area and heard about The Arena Club being one of the best facilities in the area, and I wanted to be part of that. What is your approach to training? My philosophy for training is to make my clients strong. I have a very simple approach: Getting good at the basics will transfer over into every aspect of your life. What would you say to someone who is considering personal training? Do it! Everybody should have a personal trainer. It's making an investment in yourself -- you're making a better you. What do you enjoy about being a personal trainer? My favorite thing about being a personal trainer is the relationships I build with my clients. Whether they are on a weight loss journey, wish to lead a healthier lifestyle, or are looking for new ways to stay active I value each person I have the opportunity to work with. I love helping my clients build their confidence and become proud of what their body is capable of. Justine is a Certified Personal Trainer, Group Fitness Instructor, and Fitness Nutrition Specialist. She is also an Assessor with the Les Mills US Team. On the rare occasions when she’s not teaching, training, or working out, you might find her exploring the outdoors, curled up with a book, or planning her next trip. What led you to The Arena Club? I received an Arena Club membership as a gift when I was a college student, and it’s still one of the most useful gifts I’ve received. A few years later, while living on the Eastern Shore, I became certified in Zumba. When I moved back to Harford County, I rejoined the Arena Club. Eventually I started teaching Zumba here, which led to additional certifications and eventually a personal training certification! What is your approach to training? I want people to feel good about themselves. I’ve worked with many clients with so many different goals, and I always lead sessions by asking if there’s anything specific they’d like to focus on, because it is really all about them and their needs! Today’s society is too focused on size and looks and personal appearance, when what really matters is health and happiness. There is so much more to life than a number on a scale, and I want to help my clients reach their physical goals so they feel fulfilled in all aspects of life. What would you say to someone who is considering personal training? Everyone, even trainers, can benefit from working with a personal trainer! There’s always something to learn. For those just starting out, or getting back into, an exercise routine, a trainer will provide guidance, accountability and encouragement along with a safe, custom program. Those who’ve been exercising regularly without seeing results may just need professional guidance on technique or other adjustments to finally reach their goals. Share something interesting about you: Growing up, I was a ballerina, not an athlete. I dreaded gym class until I took a weight training class in high school! By the time I was in college, I loved fitness, but I didn’t go to school for personal training. I have a B.A. in American Studies from Washington College, and I still love studying history and political and social sciences. 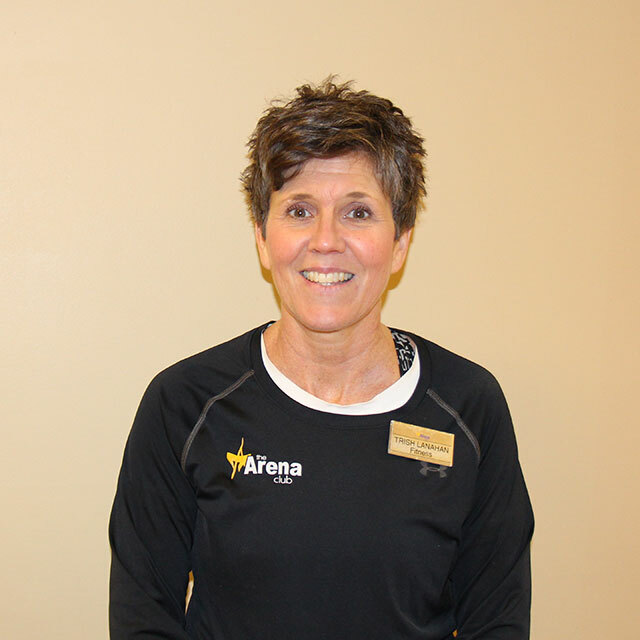 Kathy became a Fitness Specialist at The Arena Club in 2006 and was quickly promoted to Fitness Manager. In 2007 she became a Certified Personal Trainer. Kathy has also worked as a Wellness Coordinator in workplace wellness for the past six years. What is your approach to training? Before beginning a training program with a client I always sit down with them to get to know them and understand what their goals are, their restrictions, and their lifestyle so we can work together and set up for success. I believe it is important to take things slowly and to help my clients understand proper form so they can avoid injury - all while having fun and motivating them to achieve their goals. What would you say to someone who is considering personal training?Many people wan to make positive changes to their health, however they attempt it without having a real plan. Working with a Perosnal Trainer that will help you set a realistic goal, create a plan, and hold you accountable is the best recipe for success! Share something interesting about you: I was 38 years old when I found myself out of surgery, 30 pounds overweight, 2 small children, and no idea what to do. I joined The Arena Club and lost 20 pounds during my first 12 weeks as a member and that was the beginning of my fitness journey and career in the Wellness Industry. I continued to better my health and fitness and set new goals, and from age 40-42 I competed in physique figure competitions and earned several trophies. Philosophy on Wellness/Fitness: Wellness is a journey, not a destination. It's not a finish line that you cross and then are considered officially "well". Wellness is a lifestyle. It's not something you are, it's something you do. Born and raised in Bel Air, Kim ran track in high school and competed in equestrian events up and down the east coast. She graduated from JMU with a BS in Communications/Journalism. She has participated in running, cycling and triathlon events and enjoys time spent outside hiking and kayaking. What led you to The Arena Club? I started as a group fitness instructor with the Rawlings at Harford Health & Fitness in Aberdeen in 1991. When they opened the Arena Club, I happily continued with them in their wonderful new facility. I love all the different training and fitness options available to members and their trainers and I really love our staff and members, and the sense of community at The Arena Club. What is your approach to training? Talk to the client and get a feel for where they have been and where they want to go. The plan we develop is subject to change as we progress and find strengths to challenge and weaknesses to address. I try to make training both challenging and fun and aim to have my clients leave feeling better than they did when they arrived. What would you say to someone who is considering personal training? People seek out a trainer for a number of reasons--accountability, education, motivation, etc. It is extremely important to find someone who can help you achieve your goals safely and effectively, AND who is a good fit for you. Not every trainer has a style that will suit you, so watch them in action and ask questions. Bottom line, whatever the reason or goal, if you want it and commit to it, the right trainer can help you make change happen. Share something interesting about you: I competed in a bodybuilding show when I was younger. The diet was the worst part. I believe in a realistic and balanced approach to training and life. Balance effort and rest, work and leisure, and good choices with less good choices! Mark has lived in Bel Air his entire life and played baseball and hockey competitively. He has two sons, named Brooks and Kylo. He loves Star Wars, Marvel, and coffee on coffee on coffee. He has been training since 2011. What led you to The Arena Club? The people and the reputation. The trainers/staff are the best in the area. Who wouldn’t want to work with some of the top class people in all of Harford County? Working at the Arena Club has been a massive blessing to me and family. What do you enjoy about being a personal trainer? The connection with my clients. I believe God wired me to be WITH people and I absolutely enjoy the connection and trust we build together. I love helping people break past a comfort barrier. We will never get results if we stay in our comfort zones and I love helping people get past that! What would you say to someone who is considering personal training? Having a coach help you understand movements, exercises, workouts and nutrition is a GAME CHANGER! If you’re struggling with finances you’d call an accountant. If your car isn’t working properly, you’d go see a mechanic. Well, your body needs the same treatment! As a coach/trainer it is our job to get you moving correctly, feeling wonderful, looking great, sleeping great and performing at life at a higher level! Share something interesting about you: I was active in American Warrior training for 4 years. I have been with the same wonderful girl since I was 15, and we named our second son after a Star Wars character. I drink an impressive amount of coffee! Megan grew up on a cattle and horse ranch outside of Cheyenne, Wyoming. Though active in both 4-H and FHA, Megan was also a swimmer and cheerleader throughout high school. She joined the Navy in 2002 and served honorably for 7 years. She now lives in Bel Air with her husband who is still an Active Duty Navy Diver stationed at APG. What is your approach to training? Any new client should plan to have their first assessment that will last anywhere from 30 minutes to 1 hour. Sometimes a person's "WHY" lies deeper than the surface. I like to train with a more traditional style using free weights while incorporating new training techniques. What do you enjoy about being a Personal Trainer? I enjoy being a part of big transformations for all clients and seeing them accomplish all of their goals. I have a client who was participating in a mission trip to Kenya where they would summit Kilimanjaro. I worked with her for six months to help her develop the endurance, cardio, and recovery skills she would need to have a successful climb. AND SHE DID! I was so excited to see the pictures when she returned! What would you say to someone who is considering personal training? Anyone who is new or even a seasoned veteran with physical training can always learn. There is so much trendy information on the internet that understanding how to fully implement that information and technique is crucial in the physical development of an individual No two people will develop the same. What is something interesting about you? I have been a fitness competitor for five years with the WBFF. I have been published in Fit & Firm magazine and Planet Muscle Magazine. Nicole grew up in Carroll County, MD. She was a varsity track and field athlete during her four years in high school. She graduated from Salisbury University with a degree in Exercise Science and was the president and captain of the women’s rugby team. She has always enjoyed playing sports, spending time outdoors with her dogs, traveling, and cooking. What led you to The Arena Club? I I moved to Harford County in 2014 and was looking for a gym that had many of the same beliefs about training and building relationships that I did. After talking with some people in the area, it became clear to me that the Arena Club was the facility for me. I have enjoyed each day I’ve been with the Arena Club. What is your approach to training? Find something that you enjoy doing. What works for one person might not have the same appeal to another. It is important to understand who I am working with, what their interests are, and things they dislike about working out. There is more than one way to achieve the desired results, so I need to know what is the best way to keep my clients motivated on their wellness journey. My favorite thing about being a personal trainer is the relationships I build with my clients. Whether they are on a weight lose journey, wish to lead a healthier lifestyle, or are looking for new ways to stay active I value each person I have the opportunity to work with. I love helping my clients build their confidence and become proud of what their body is capable of. What would you say to someone who is considering personal training? The most important thing about personal training would be accountability and safety. You schedule the appointment, show up, workout, and go home! A trainer will take care of making a custom workout plan for you and your needs. Going to the gym no longer has to be a guessing game about what exercises you will do that day. A trainer is also there to make sure every exercise is completed properly and safely. Finally, the relationships we build with our clients makes the entire process more fun and engaging for both parties. Share something interesting about you: I love being outdoors and hiking/camping different areas with my family and my dogs. My husband and I have a goal to hike all the National Parks in the United States! I would also love to complete a through hike of the Appalachian Trail (Maine to Georgia), but I don’t think we can spare 4-6 months to hike along the East Coast. 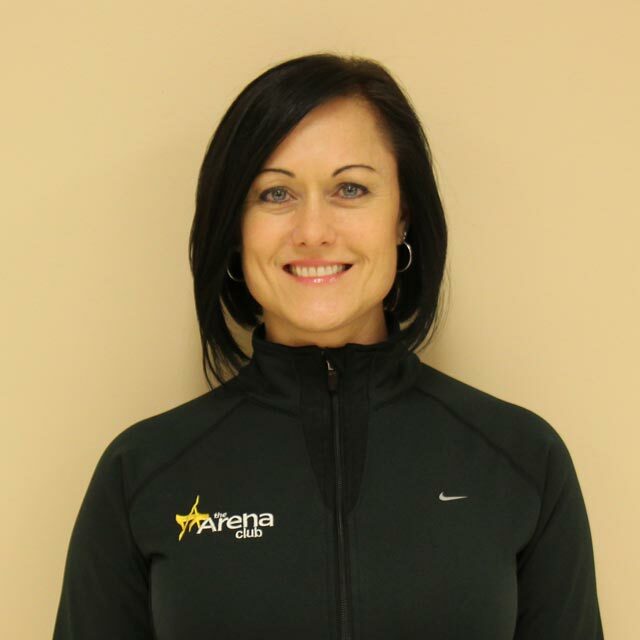 Nicole has been with the Arena Club since 2007 and is our Wellness and Athletics Director. She has trained hundreds of members and developed a team of professionals to work with our community. She brings a level of high energy, consistency and results to every client and member she works with. She has a variety of certifications in the industry and holds a Bachelors Degree in Exercise Science. What would you say to someone who is considering personal training?Having a personal trainer is the best next- step- decision you can make for yourself. No matter your fitness level, a personal trainer will create a customized plan that will consider all of your needs - physical, mental, emotional, functional- to help you ensure success. Your trainer will challenge you to reach new goals that are attainable and possible and push you to new limits in a safe, fun and positive environment. Your trainer will even be one of your closest friends! What led you to The Arena Club? While in college, I was working at a small training studio when the opportunity for me to come to the Arena Club under my mentor at the time was presented to me. I was a young trainer coming into a team of seasoned professionals and I was welcomed right away and made part of the family here. What is your approach to training? I like a simple approach that begins with a clear understanding of expectations for both the client and the trainer. I find that a solid understanding of my clients needs and goals lends the ability to provide them tools and avenues to success. I like to provide realistic expectations and give a clear direction on how to get there. What do you enjoy about being a personal trainer? I love the relationship I get to have with every client I work with. They hire me to help them get results - but along the way I have been so blessed to have my clients at every stage of my life too. I have the best relationship with my clients and have made lifelong friendships with nearly every one of them. Share something interesting about you: I love to travel and spend as much of my free time with my family and friends. I am a wife and a mother. I was an optional level gymnast. I began bow hunting in 2017 with my husband. I am high energy and rarely sit still. I hate naps and I rarely sleep past 6 AM! Qadry Ismail grew up in Wilkes-Barre, Pa. and attended Meyers High School where he excelled in both football and track. He is a Hall of Fame member of the State of Pa Track & Field Coaches Association, was named the #1 high school hurdler in the nation by T&F News, and was inducted into the Meyers High School Wall of Fame for football and track. Qadry attended Syracuse, earning a B.A. in Speech and Rhetorical Studies. He is a two sport All-American (football, track); Super Bowl champion, Baltimore Ravens the "Go-To" receiver on the 2000 team; and played professionally for 10 seasons. What is your approach to training? I call it the "Walk Beside" - helping people in their quest to live a healthy and productive life. I feel that by helping a person improve biomechanics they will gain proper movement over their body. For example, less restrictions to the hamstrings lead to a better gait cycle within a walk, run or sprint. Working people in all planes of movement is the key to helping people improve their fitness. From TRX, Kettlebells, dumbbells, barbells, medicine balls, slam balls, sleds, resistence bands, mini-hurdles, treadmill, rowers, BOSU balls, and rings... They are all in my arsenal to help one in the multi-planes they live in each day! Anyone can get you tired, but can they get you better? Form dictates function, proper form commands a better performance. If I can identify your weakness in your biomechanics and empower you to fix them and get rid of them for good, then you will function in your daily life pain-free and more capable to handle the stressors of the day-to-day living. I have been in the sports broadcasting industry for nearly 20 years. Clients both young and old are always surprised to see or hear me on radio or television! I go from workout gear to custom suits! I can clean up well. Rose grew up in South Philly but later moved to Maryland where she has lived most of her adult life. She spent many years in the medical field then moved on to being a wellness coach and personal trainer to continue her passion for helping people. In her free time she enjoys spending time with her family and volunteering at shelters. What is your approach to training? I am a trainer who likes to know everything I can about my clients from medical problems to exercise history. I like to know there availability for training, how often they want to train and what they want out of the training. I feel the more I know about my client the easier it is to provide workouts that are safe and rewarding. What would you say to someone who is considering personal training? Having a personal trainer can help you in many ways. Some examples include holding you accountable to helping you prepare exercise routines. A trainer can help you stay focused and reach your goals regardless of your experience level. Share something interesting about you: At one point in my life I was an overweight stress eater with high blood pressure. I decided something had to change and started my weight loss journey through our 20/30 program. I have been able to help others using my experience as a reference. Sandy was born and raised in Bel Air. She attended The John Carroll School participating in cheerleading, softball, and swimming. She continued her cheerleading career at the University of Dayton where she received a degree in Education. Additionally, Sandy earned a Master’s degree in Exercise Science and Health Promotion from Florida Atlantic University. In her free time, Sandy enjoys spending time with her family and dogs, hiking and running outdoors, reading, and going to the beach. What led you to The Arena Club? Prior to the Arena Club, I was a health teacher for Harford County Public Schools. I have always enjoyed being a member at the Arena Club. When I decided to stay home with my children, I knew I had to continue my passion, fitness and health. I began as a group fitness instructor teaching BODYATTACK and aqua aerobics classes and FELL IN LOVE! I continued to seek educational and training opportunities through additional certifications and courses such as ACE group fitness instructor, cycling, BODYSTEP, and NSPA personal training. Personal training and group fitness are my passions and I LOVE MY JOB! What is your approach to training? Personal training is an amazing way to help people achieve their goals and make lifestyle changes. Before the first training session, I get to know my client’s goals, lifestyle, support system, previous successes and obstacles, and their interests. Based on our initial consult, a personal program is created outlining goals, recommendations, and suggestions. Each session is designed with the clients’ goals and personal information in mind. Further, I believe in communicating with my clients on a regular basis and creating independent fitness plans in which the clients feel confident and successful. What would you say to someone who is considering personal training? I have a true passion for health and fitness. Reaching your fitness goals is a journey that we will travel together integrating exercise with other healthy lifestyle changes. Discovering what works for you and the fun in exercise creates a lifelong commitment to health and fitness, increases your quality of life, and helps you achieve your goals. Share something interesting about you: Cheerleading is where it all began! My interest in strength training began with the weight lifting sessions completed with my college cheerleading team. I loved seeing how certain strength training exercises could improve the execution of stunts and tumbling. During and following college, I worked for a professional cheerleading company (U.C.A.) and coached cheerleading for many years. As a coach and instructor, I enjoyed helping other cheerleaders become successful and confident. Sean grew up in Central New Jersey, participating in many team and individual sports. Sean’s true passion for fitness came from playing football and the lessons he learned through injury. This path lead Sean to earn his Bachelors and Masters degrees in Exercise Physiology at Rutgers University. 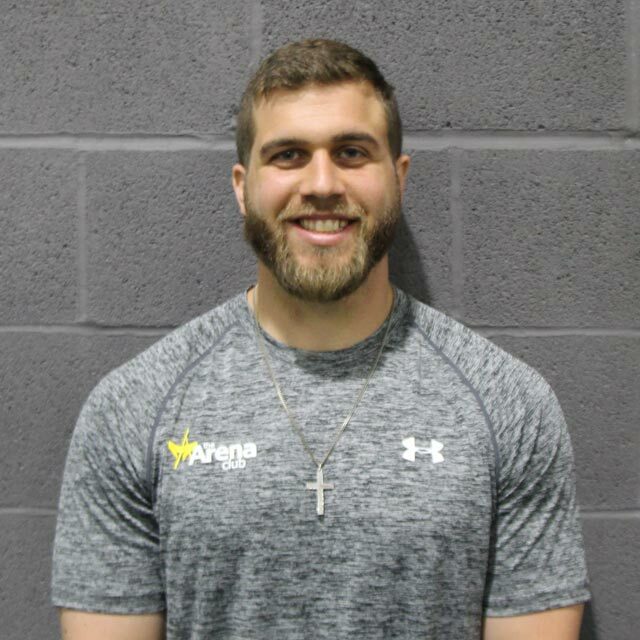 Sean has been a strength coach for almost a decade working with general population, elite athletes and US Air Force Special Forces. What led you to The Arena Club? Being new to Bel Air and Maryland, finding The Arena Club has been a great suprise. 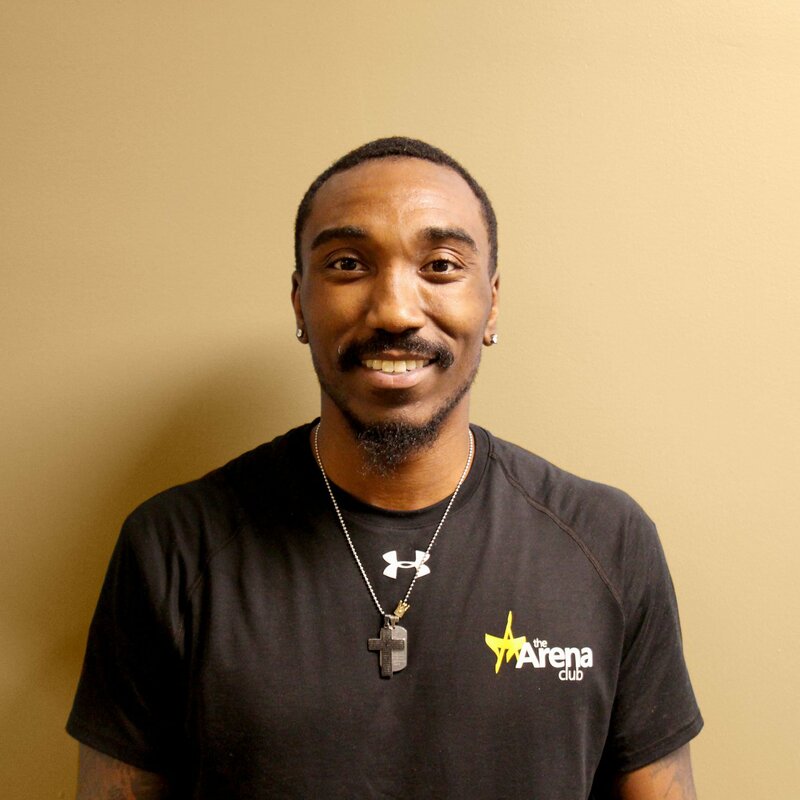 The Arena Club allows me to continue my passion for fitness and helping others reach their goals. The Arena Club offers a unique opportunity to join my desire to work with general population, rehabilitation and athletes. What is your approach to training? Before we begin training, I like to learn about a new client by having a private conversation prior to the first session. This gives the client to learn about me as a trainer and for me to learn what drives the client. Next, we will assess how you move and your starting fitness. My biggest fear is havng a client suffer an injury; knowing my client’s health history, movement patterns and fitness considerably decrease that risk. What do you enjoy about being a personal trainer? What motivates me to be a personal trainer is the clients I am lucky enough to assist. Guiding each client as they grow personally, achieve physically and overcome the inveitable setbacks. Over my career those clients who have shown the greatest improvement are the ones who were intimidated by the gym or the thought of working with a trainer. By setting small, achievable goals and through our relationship these clients found their passion for fitness. What would you say to someone who is considering personal training? Having a personal trainer helps you stay the course over your fitness journey. The trainer is there to help keep your goals in sight when things get tough, celebrate your many successes and evolve your plan as you improve. I believe in trainers so much that I will often purcahse sessions or attend other trainer’s classes to learn and help push myself. Share something interesting about you: Prior to arriving at The Arena Club, my wife and I have been living in Europe for the last two years. We worked as contractors with the USAF just east of Cambrdge, U.K. and over that time have traveled to 22 different countries. Shaunna is from El Paso, TX. She was a gymnast from a young age, participated in many different sports throughout high school, and was a collegiate cheerleader for the University of Texas - El Paso. Shaunna currently holds a Bachelor’s degree in Health Sciences and a Master’s degree in Education. 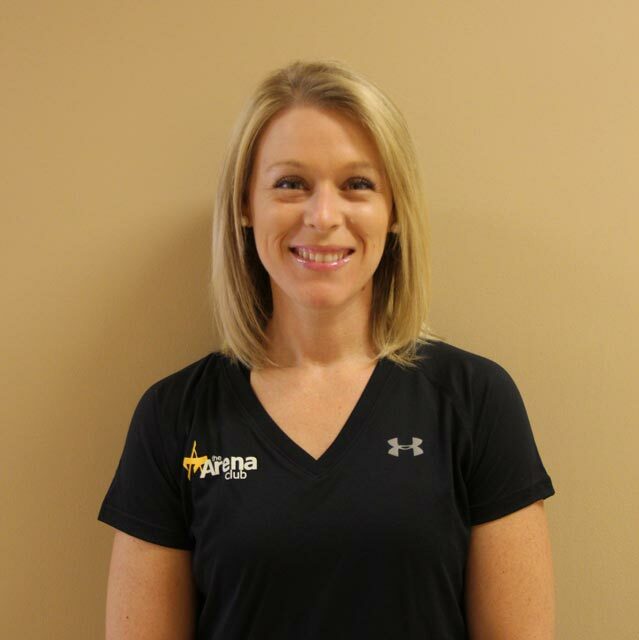 Shaunna’s certifications include Les Mills BODYATTACK, BODYPUMP, BODYCOMBAT & GRIT; ACE Group Fitness; NSPA Personal Training. What led you to The Arena Club? We moved to Maryland in 2012 and joined The Arena Club soon after moving. I was a member and class participant for 3 years before deciding to become a group fitness instructor in 2015! I was so inspired by the instructors and trainers here that I too wanted to be a part of helping people through fitness! I have loved every minute of it, and decided to expand my fitness career with personal training. It has been a wonderful experience, and I look forward to helping many more people! What is your approach to training? Getting to know every client is key. I like to find out as much information as possible through an initial consultation so that I can develop the absolute best program that is tailored to that individual. I spend extensive time on program development specific to their needs and goals. I utilize pre/post assessment data to track results as I help clients work towards their goals. What would you say to someone who is considering personal training? Securing a personal trainer can help you achieve your goals faster and better than working towards them on your own. You’ll have someone in your corner, to help you with accountability, as well as coach you through consistent activities that will catapult you toward your results. Everybody needs a coach to take their training to the next level. Share something interesting about you: I am a former middle school teacher. Throughout my teaching career in Illinois, I taught health, science, social studies and language arts across all three grade levels! Additionally, I have over 20 years of cheerleading coaching experience, as well as, extensive experience judging competitive cheerleading. Susan was born and raised in Harford County. Prior to coming to The Arena Club she trained race horses on MD racetracks and raised three children. She has a degree in Political Science. When not at The Arena Club, she enjoys anything outdoors, especially riding her horse, working with her labs and kayaking. What led you to The Arena Club? I joined the team at The Arena Club after my youngest son graduated from high school. I know how important exercise and nutrition are to our vitality and quality of life. I wanted to help people and pass that on. Nothing is more rewarding than seeing a person get stronger, feel better, play better, stay on the field longer, and have the quality of life that lets a client live their life to the fullest. What is your approach to training? I conduct a physical assessment of my client or speak with the coach or therapist to assess what is needed for each client. I am a Pilates Reformer instructor as well as a Personal Trainer so I do use the reformer and other equipment available in the Pilates Studio. Every client has different needs so the freedom to tailor workouts to suit those needs is fun! What would you say to someone who is considering personal training? Just do it! What do you have to lose? You have everything to gain! A personal trainer is a professional who knows what will suit to your needs. What are some of your specialties? I have worked with all ages and abilities. I have worked with tweens ages 10-11 years of age since 2010. It is so much fun to introduce kids to exercise and healthy lifestyle choices. I have worked with athletes as well for many years, introducing Pilates Reformer into their training routines, working closely with their trainers to build specific programs for their specific sport. I have also worked with physical therapy patients transitioning out of their therapy back into a workout routine. Share something interesting about you: I am an active equestrian. I have been riding horses since I was a child. Any spare time that I have, you can find me riding my thoroughbred gelding. Susan moved to Maryland about 6 years ago to be closer to her grandchildren. She has worked in the fitness industry for over 30 years including teaching group exercise classes, cycling, yoga, Pilates and personal training. When not exercising or training she enjoys being outdoors, spending time with her animals, gardening and working in the yard---Oh yes! and the beach at sunrise and sunset. What led you to The Arena Club? I came to the Arena Club a few years ago because of a move to Maryland. When I came to check it out I was blown away by their level of service and cleanliness. After only a few fitness classes I also realized how talented and well trained their instructors were. What is your approach to training? I like to know what form of exercise they are using and how often. Asking if they have any past or current injuries or surgeries. My passion is Pilates and I always do a structural assessment on any new client just to look for imbalances or concerns before we start. Every session will start and end with feedback from the client. What would you say to someone who is considering personal training? Everyone can benefit from a personal trainer because they can keep you accountable and keep you moving. As you know, moving actually increases energy and can help with pain levels. I think most of us want to be the best version of ourselves and feel better and a knowledgeable trainer can guide you toward that end. What are some of your specialties? The past decade I have spent much time pursuing more training for clients with different imbalances which lead to injuries and structural changes. Many start with the feet, hips and become back issues. This has led me to Pilates and all it can achieve in a client's body. I enjoy working with clients as they heal from injuries or surgeries and the Pilates reformer enables one to work out in a very safe environment. Share something interesting about you: I was raised on a horse farm and grew up riding, training and showing Quarter Horses. I have a love for horses and all animals and the outdoors. One other fact was for a short time I was a bodybuilder and definitely understand the dedication it takes to prepare for competition. Tim grew up in Baldwin, Maryland and attended Fallston High School. Prior to coming to the Arena Club he attended Harford Community College where he majored in Criminal Justice. 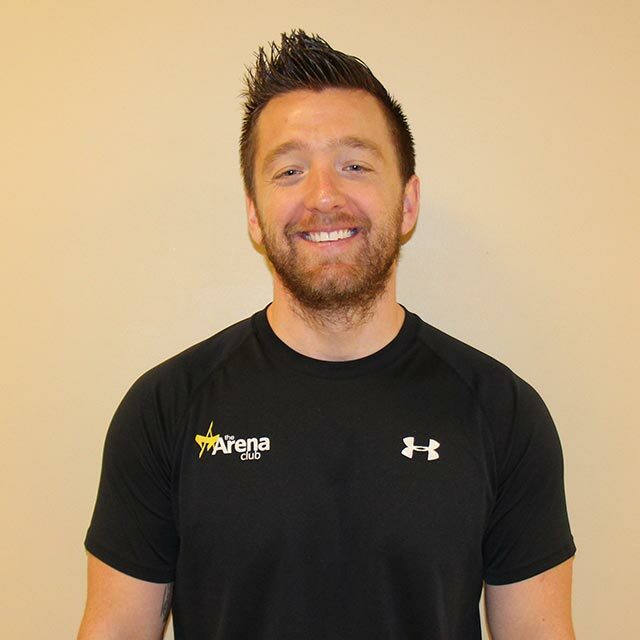 Tim is a NSPA certified personal trainer, a BOLC certified lifting coach, and a MORR sports performance coach. What led you to The Arena Club? 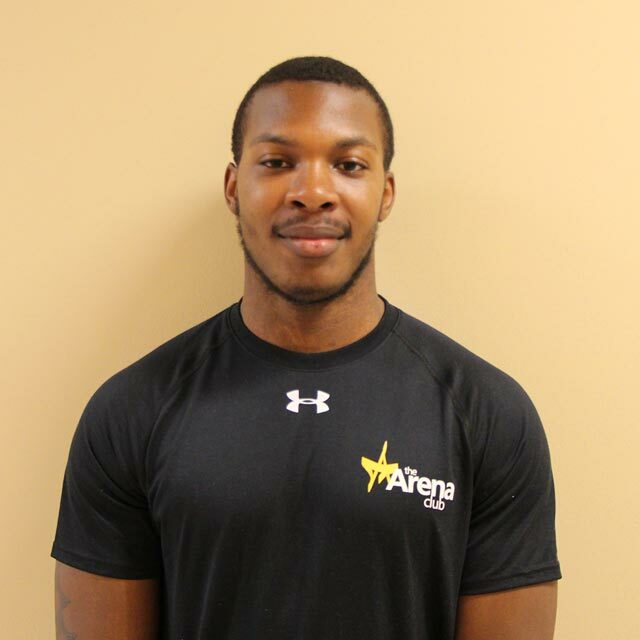 I started working at The Arena Club in 2009 in the Arena Kids and Arena Tots programs. I have also worked with the Before and After School Program as well as the annual Summer Camp. After a few years and constantly being in the gym setting I decided to get a personal trainer for myself to become familiar with weightlifting. I began to notice positive changes in myself and fell in love with physical fitness which led me to where I am today...an Arena Club personal trainer. What is your approach to training? It is very important for me to get know my clients on a personal level. I want my clients to get to know me as well…but most importantly trust me. What would you say to someone who is considering personal training? Having a personal trainer is extremely beneficial to your overall fitness experience. Personal trainers provide a wealth of knowledge as well as a variety to your workout experience. Some people just need that extra push or that “last rep” and that’s why we are here. Share something interesting about you: I have ran the Baltimore Half Marathon 3 times as well as participated in The Savage Race as well as The Color Run. Trish grew up in Baltimore, Maryland. She played Division 1 basketball at Fairfield University where she received her BS in Sociology. Prior to coming to The Arena Club she was a stay at home mom. She enjoys spending time with her family and 2 beautiful German Shepherd girls. What led you to The Arena Club? I came to The Arena Club because I was so passionate about fitness. I have been here since 2006 because of the members and my coworkers. It is like family. What is your approach to training? I do a one-on-one consultation to get to know the client. We talk about anything and everything. It is the foundation to our trust and relationship. We talk about goals, road blocks, and strategies to become successful. Communication is the KEY. If we communicate then we will be successful. It might not always be easy, but it will be worth it. What do you enjoy about being a personal trainer? For me as a personal trainer, one of the most enjoyable aspects of my job is to see the confidence gained by working out. It is amazing. I work a lot with the senior population and to see them flourish and grow is just so rewarding to me. They have taught me that you are never too old to exercise, and the stories I hear are life changing. What would you say to someone who is considering personal training? Having a personal trainer is for sure a game changer. You will be held accountable and get 100% one on one supervision and attention. Personal training is an investment...but an investment in you. And YOU are ALWAYS worth it. Share something interesting about you: I was diagnosed with MS in 1996. Most people would never know. I try to exercise daily to help the slowing process. Also, I have several tattoos. Just love them. Each one I have has a story. Wendy graduated from Virginia Tech in 1990 and has lived in Harford County for the past 15 years and calls this HOME! When not at The Arena Club she enjoys family time out on the water either boating or stand-up paddleboarding! What led you to The Arena Club? When I moved to the area I had already been a fitness professional for MANY years. I applied to every gym in the area and took the job that had the BEST facility, STRONGEST team, and FRIENDLIEST atmosphere! What do you enjoy about being a personal trainer? I've always enjoyed physical activity and if I can share that love with others I feel fulfilled. We are so much stronger than we realize, and when you can help someone realize their full potential it is ery rewarding. When you improve someone's physical abilities, you change their life! What would you say to someone who is considering personal training? EVERYONE with a gym membership should invest in a quality personal training program regularly! Exericse is a science that continues to evolve. Partnerwing with a fitness professional ensures safety and results! Philosophy on Wellness/Fitness: Fitness isn't a temporary fix- it is a lifestyle practiced and enjoyed daily.